← Not just a new year, but THE year! First couple of days at the London Boat Show have been great if not slightly tiring round the edges. This is a photo from day 1. We’ll be here along all week so do pop along and say hello and meet the boat too. Looks good , my Sugar Plum. Looks good!! I am looking forward to being there with you on Wednesday!! I hope you are enjoying the show and I am glad you could use the photo. What a coincidence with the rowers on the screen in the background! 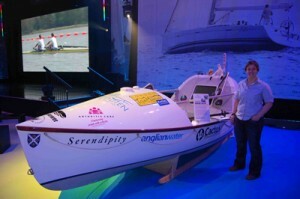 Hey Sarah, it was great to meet you on Saturday, Still not been able to see you and Serendipity but it is coming back. I am still amazed that you wanted to see me. You are the inspiring one I am just doing what I love and anyone who loved their hobies as much would do the same. I can’t wait to hear from you and to tell all at Rutland Sailability about you. Will send you a copy of our photo.